Originally built as a research vessel for the National Oceanographic & Atmospheric Administration (NOAA), the mv Ushuaia has been refurbished into a comfortable expedition ship that’s ideal for exploring the waters and coasts of the Antarctic. You’ll find General Tours ice-strengthened polar vessel to be well-appointed with a comfortable Dining Doom and an Observation Lounge + Library where you can also enjoy informative talks with General Tours shipboard experts. With ample deck space and General Tours unique Open Bridge policy, you’ll always have a great vantage point to take in the scenery and wildlife when not ashore. With only 90 passengers and a full fleet of Zodiacs, you’ll enjoy superb landings and wildlife viewing opportunities on the otherwise inaccessible coastline. On arrival, you’ll be warmly greeted and escorted to the 5-star Arakur Resort & Spa. In the morning General Tours hope to reach West Point Island to visit an unusual colony of Black-browed Albatross, that we’ll find nesting together with very energetic Rockhopper Penguins in the shadow of the island’s impressive cliffs. A gentle slope leads up to the site and on General Tours way General Tours can enjoy the beautiful views of the countryside. Once a thriving whaling station, the remains of Grytviken stand as a reminder of an era of exploitation that thankfully grows more distant by the day. Grytviken has an excellent natural history museum but also offers possibilities for hikes in the surrounding mountains. A short zodiac ride around King Edward cove brings us to the grave of Sir Ernest Shackleton. Join the Ushuaia’s staff for a graveside toast honoring this remarkable explorer and venerated mariner. Sometimes called the “Serengeti of the South”, Salisbury Plain is a wildlife site without parallel. Several large glaciers provide a dramatic backdrop for the tens of thousands of King Penguins that breed in the tussock grass of this remarkable ecosystem. The wide beach makes for excellent walking as General Tours visit the colonies, where General Tours are literally surrounded and delightfully outnumbered by throngs of curious, gentle penguins. In November the beaches are a haven for fur seals, which will give birth at this time. Elephant seal weaners will also join into the general concert and some big elephant seal bulls are lazing a bit further away from the waterfront. Southern Giant Petrels and the occasional wandering Gentoo Penguin will also make for great photo opportunities. Prepare for an awe-inspiring experience. Prion Island is a beautiful tussac-grass covered islet. With luck, you’ll have an opportunity to see a breeding colony of Wandering Albatross on the summit of the island, which is accessible by a wooden boardwalk with comfortable viewing platforms. 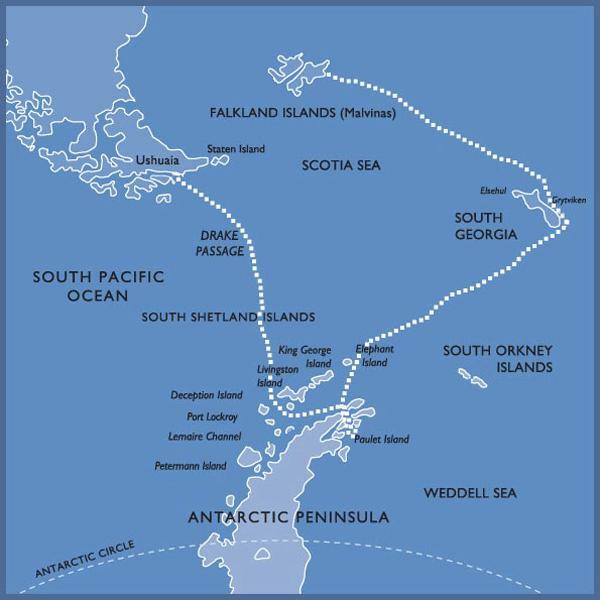 Cooper Bay is at the southeast tip of South Georgia and offers a wealth of wildlife including Chinstrap, Gentoo and Macaroni Penguins. There are also plenty of fur seals on the beaches. Fascinating volcanic rock formations tower over small fjords, making this a terrific place for a thrilling Zodiac cruise to watch wildlife from the waterfront. The surf beaten coastline at St. Andrews Bay runs north-south in a nearly 2-mile long sweep of fine dark sand, covered in penguins and seals and bounded in the interior by the Cook, Buxton and Heaney Glaciers. The bay hosts the largest colony of King Penguins on South Georgia. At this time of year, the beach is often crowded with fur and elephant seals. Such a large assemblage of wildlife attracts an entourage of persistent and voracious scavengers. Sheathbills dart in and around the penguin colony and Cape Petrels nest on the cliffs north of St. Andrews Bay. Leopard seals patrol the rocks at this end of the beach too, hunting penguins along the edge of kelp beds. A few White-chinned Petrels and Light-mantled Sooty Albatross nest on the tussock slopes. Brown Skuas and Antarctic Terns breed on the outwash plain and scree slopes at the north end of the beach, defending their nest sites with their characteristic noise and vigor. The 9-mile long Drygalski Fjord offers spectacular scenery. Although Drygalski Fjord’s glaciers have retreated over the recent decades, they remain one of the most striking features of this coastline, particularly the Risting and Jenkins Glaciers. This is also one of the principal breeding areas for Snow Petrels in South Georgia. The birds nest on the cliff buttresses and mountain ridges along the shores and mix with Cape Petrels on the lower ledges. Both species can be seen flying along the cliffs as they come and go from their nest sites. Blue-eyed Shags, Wilson’s Storm Petrels and Antarctic Terns are also a common sight as they feed in the plankton-rich upwellings in front of the glaciers. At the northern tip of the Antarctic Peninsula the mighty ice-tongue of the Depot glacier has cut a broad valley into the continent. In the meantime the glacier has retreated and left a large inlet, Hope Bay. It is here, where the biggest station of the entire Antarctic Peninsula is situated, the Argentine Station Esperanza. The friendly base personnel might give us a tour of their installations, including the little church and the school they operate for their children. This promontory on the Tabarin Peninsula just south of Hope Bay is the center of the Peninsula’s Adélie Penguin populations. This region of broad straits, mountainous islands, protected bays and narrow channels offers moments of solitude. A profusion of tall peaks, never scaled by humans, and vast glaciers add to the remote beauty of these waters. This small group of islands which lie at the northern entrance to the Gerlache Strait is home to breeding colonies of Chinstrap Penguins, Blue-eyed shags and Kelp Gulls. In the center of the Gerlache Strait in the scenic Errera Channel, this pristine island has a raised beach that provides a nesting site for many Gentoo Penguins. Long ago, volcanic pressure on Deception Island resulted in a tremendous eruption that caused the island’s peak to explode. The resulting caldera flooded with seawater, creating the unique landmass General Tours may visit today. General Tours Captain will expertly pilot the ship through a narrow gateway in the icy cliffs of the island, taking the MV Ushuaia into the caldera itself. Hundreds of thousands of Chinstrap Penguins inhabit the outer volcanic slopes of the island at Baily Head, along with nesting Pintado Petrels and Antarctic Terns. This crescent-shaped island at the entrance of Moon Bay is home to Chinstrap Penguins who thrive in this breathtakingly beautiful and pristine environment.